When it came to choosing this month’s topic, I thought that going beyond food on the plate would be an interesting idea. Foodies are spoiled for choice, not just at the dinner table but even with what to read, watch or even listen to. Books, magazines, television shows and even podcasts are like a vast buffet of delights ready to indulge every food passion, desire and fantasy. The mere fact that you are reading this blog is a testament to how prevalent food is in our streams of information and entertainment. In the end, I guess this topic was inevitable. What I did not realize was how difficult it would be. Not because there wasn’t enough food-related media to choose from but because there was too much that I loved. Forced to choose, I made lists, categorized, negotiated, pondered and wondered why the heck did I make it so hard for myself. After several days of hair pulling, I finally settled on my choices. And although these may not be the only food media that I enjoy, they are definitely the ones that make food absolutely amazing (at least for now). It was her name that caught my eye. I first encountered cookbook author and Chinese culinary expert Fuchsia Dunlop in a video on Serious Eats, cooking a Taiwanese version of the popular dish, General Tso Chicken. One year and a food blog later, I find myself searching high and low for Ms. Dunlop’s first cookbook called Land of Plenty. It’s easy to assume that Chinese cuisine is a homogeneous set of dishes similar in both ingredients and techniques. If one takes a closer look, a whole new world comes alive, filled with depths of differing regional flavors and textures. One could spend a lifetime understand the complexities of any Chinese regional cuisine. And that’s exactly what Ms. Dunlop has done. 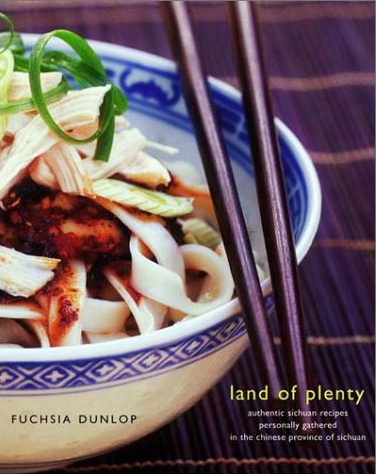 In her first cookbook, Ms. Dunlop takes her readers on a tour of the Sichuan province by describing the intricacies of its unique cuisine. Sichuan is known for food that’s hot and spicy but Ms. Dunlop shows how it is so much more. Sichuanese cuisine is popular in China for its unique flavoring methods, creating dishes that are complex and diverse. Personally speaking, I couldn’t have asked for a better tour guide than this collection of stories and recipes–a gastronomical starting point into the land of Chinese cuisine. If you are wondering about the title of the book, in English, Sichuan translates into the Land of Plenty. Besides being a nationally acclaimed food writer, cookbook author and a television host, Mark Bittman writes a column for the New York Times called The Minimalist. In the online version of The New York Times, Mr. Bittman not only has his own food blog called Bitten but also, as an extension of his weekly feature, he stars in his own cooking video podcasts. With acerbic wit and a straightforward approach, he demystifies the process of cooking by creating dishes that require the bare minimum of ingredients and effort, thus making cooking at home as stress-free as possible. I’m by no means a professional chef so I’m all for any help I can get in fashioning a delicious dish with little work and a minimum amount of time but with maximum taste. Admittedly, I haven’t made many dishes from Mr Bittman’s videos. But watching this guy with his unpolished manner and no-nonsense attitude cook with such a passion for food just makes me want to heat up my stove, break out my pans and get cooking. For more of The Minimalist on video. To check out Mark Bittman’s blog, Bitten. Edward Michael ‘Bear’ Grylls is a British adventurer, trainer, author and more importantly, the host of the how-to survival show, Man vs. Wild. Each week, Mr. Grylls takes his audience to a different inhospitable locale and demonstrates the techniques and skills necessary to survive–including what one must eat to live. I admit it. This is not your typical food show. In fact, it isn’t a food show at all. 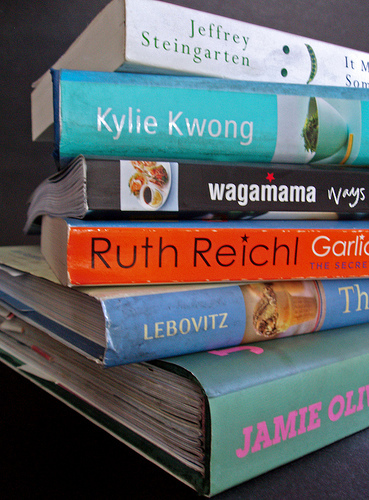 I could have easily gone with the obvious like Top Chef or Food Lover’s Guide to the Planet (aka Diary of a Foodie). But if there is one thing this show proves is that food is not always about pleasure. More often than not, it is about sustenance. Feeding one’s self in order to endure. Man vs. Wild also confirms the adage that one man’s trash is another man’s treasure. But why exactly does a society’s delicacy (goat’s eyes, snake’s blood or yak’s liver) have to be so gruesome to eat? I’ll never know. But who am I to speak? I come from a culture that advocates the eating of underdeveloped duck fetus as a late night snack. In the end, to each his own. I have Fuschia Dunlops new book, it makes me miss China and travelling around the country a lot. Hi wysgal. I agree with you completely. But I tend to wake up with serious hunger pangs in the morning. Hi Mila. I'm planning to work my way through all her books. Love reading her.